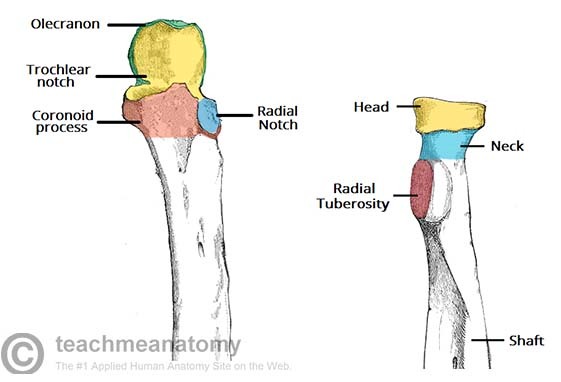 Proximal radioulnar joint: This is located near the elbow, and is an articulation between the head of the radius, and the radial notch of the ulna. Distal radioulnar joint: This is located near the wrist, and is an articulation between the ulnar notch of the radius, and the ulnar head. Both of these joints are classified as pivot joints, responsible for pronation and supination of the forearm. In this article, we shall look the anatomy and clinical correlations of these joints. Fig 1.0 – The proximal radioulnar joint, with the annular ligament. 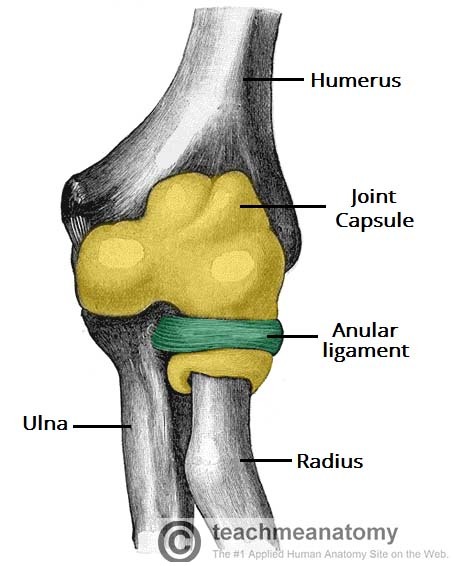 The proximal radioulnar joint is located immediately distal to the elbow joint, and is enclosed with in the same articular capsule. It is formed by an articulation between the head of the radius and the radial notch of the ulna. The radial head is held in place by the annular radial ligament, which forms a ‘collar’ around the joint. The annular radial ligament is lined with a synovial membrane, reducing friction during movement. Movement is produced by the head of the radius rotating within the annular ligament. There are two movements possible at this joint; pronation and supination. Pronation: Produced by the pronator quadratus and pronator teres. Supination: Produced by the supinator and biceps brachii. Fig 1.1 – Articulating surfaces of the proximal radioulnar joint. This distal radioulnar joint is located just proximally to the wrist joint. It is an articulation between the ulnar notch of the radius, and the ulnar head. Binds the radius and ulna together, and holds them together during movement at the joint. 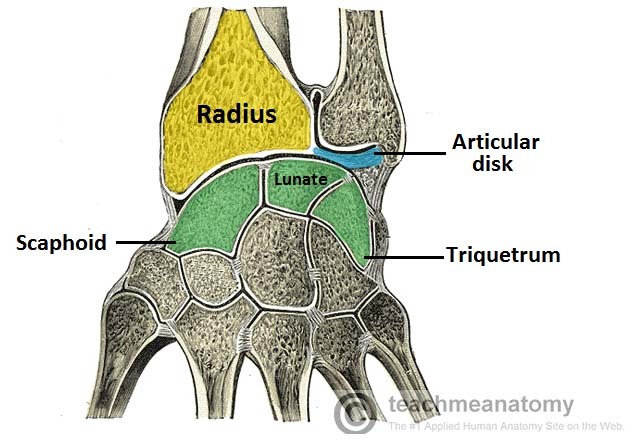 Separates the distal radioulnar joint from the wrist joint. Like the proximal radioulnar joint, this is a pivot joint, allowing for pronation and supination. The ulnar notch of the radius slides anteriorly over the head of the ulnar during such movements. Fig 1.2 – Articular surfaces of the distal radioulnar and wrist joints. The interosseous membrane is a sheet of connective tissue that joins the radius and ulna together between the radioulnar joints. It spans the distance between the medial radial border, and the lateral ulnar border. There are small holes in the sheet, as a conduit for the forearm vasculature. Holds the radius and ulna together during pronation and supination of the forearm, providing addition stability. 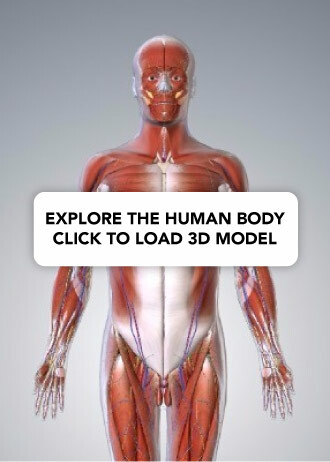 Acts as a site of attachment for muscles in the anterior and posterior compartments of the forearm. Transfers forces from the radius to the ulna. Fig 1.3 – The ring structure of the forearm bones. Although the radius and ulnar are two distinct and separate bones, when dealing with injuries to the forearm, they can be thought of as a ring. A ring, when broken, usually breaks in two places. The best way of illustrating with is with a polo mint – it is very difficult to break one side without breaking the other. Monteggia’s Fracture – Usually caused by a force from behind the ulna. The proximal shaft of ulna is fractured, and the head of the radius dislocates anteriorly at the elbow. Galeazzi’s Fracture – A fracture to the distal radius, with the ulna head dislocating at the distal radio-ulnar joint. What is the name of the landmark marked ‘?’ in the image? Which of the following movements are the radioulnar joints responsible for? Which ligament holds the radial head in place?